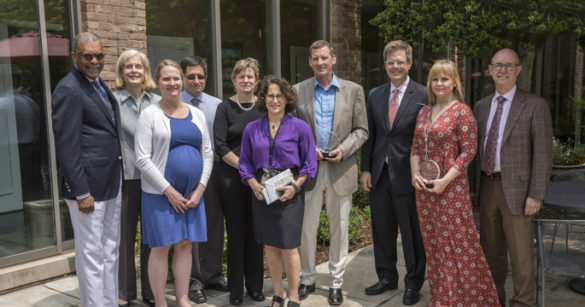 Laboratory and administrative personnel at Vanderbilt University Medical Center were honored last week for research excellence during the 13th annual Research Staff Awards luncheon at the University Club. • Nurgun Kose, B.S., research assistant III in the Vanderbilt Vaccine Center, who received the Edward E. Price Jr. Award for Excellence in Basic Research. In her opening remarks, Jennifer Pietenpol, Ph.D., VUMC’s Executive Vice President for Research and director of the Vanderbilt-Ingram Cancer Center, noted the “truly remarkable” growth of Vanderbilt’s research portfolio over the past decade. “Without the dedication, without all the long hours and time and effort of these research staff, we would not be making the discoveries we’re making or the advances for our patients,” Pietenpol said. DeMatteo has worked at VUMC for 33 years. Since 2005 he has been an integral part of the research group led by Nancy Brown, M.D., chair of the Department of Medicine and former director of the Division of Clinical Pharmacology. André Churchwell, M.D., holder of the Levi Watkins, Jr., M.D. Chair and senior associate dean for Diversity Affairs at Vanderbilt University School of Medicine, introduced the Vivien A. Thomas Award, named for the pioneering surgical technician who began his career at Vanderbilt in the 1930s. Maruri earned her master’s degree in public health from the University of Alabama at Birmingham. In 2004 she was hired by Timothy Sterling, M.D., to coordinate a clinical tuberculosis study. April Pettit, M.D., MPH, assistant professor of Medicine, nominated Maruri and cited her superior organizational skills, attention to detail and outstanding critical thinking skills. “She can do just about anything,” Pettit said. Lawrence Marnett, Ph.D., dean of the basic sciences in the School of Medicine, introduced the Price Award, named for the late Edward E. Price Jr., an internationally known research assistant in the Department of Biochemistry and Cardiovascular Physiology Core. Several members of the Price family attended the luncheon. Each recipient was given an award check and crystal trophy.